Throughout my four years at Texas A&M, I was fortunate enough to travel to a number of remarkable places. From Germany to Tanzania, and from Israel to the Philippines, I had developed an insatiable sense of wanderlust. It was this constant desire to do more and see more with my life that led me to the Globetrotter Grant. 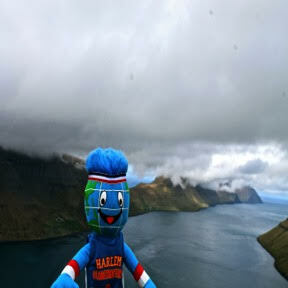 Globie catching a view of the serpentine island of Kalsoy from atop a mountain in the Faroes. One of the things that immediately appealed to me about the Globetrotter Grant is that its scope, in terms of where you can travel with the funding, is unlimited. Every other trip I had been on in college, no matter how exciting or exotic, had been prearranged by some entity. Whether they were planned by Army ROTC, the Corps of Cadets, or the Study Abroad Office, others largely dictated my itineraries. While I was presented with fantastic opportunities and experiences in the past, in terms of unbridled potential to go truly anywhere on the generous funding it supplies, the Globetrotter Grant is unique. This being the case, I sought to take full advantage of this. For a long time, I had been dreaming and saving bits of money to try and fund a trip to the Faroe Islands. For those of you that have never heard of them, you are likely in the majority. I myself stumbled across them by chance on a travel website years prior. Basically, they are 18 small islands that are East of Iceland, North of Scotland, and West of Norway. They have over a thousand years of legendary history that begins with the Vikings, and today they are a self-governing protectorate of Denmark with a uniquely preserved culture and completely unspoiled bounty of natural scenery and wildlife. Interested yet? So was I, and with the Globetrotter Grant in hand, I was finally on my way. 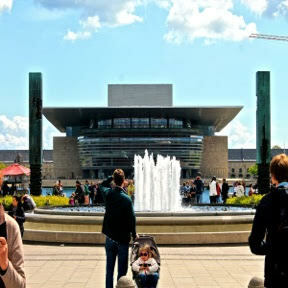 The famed Copenhagen Opera House, with a roof as big as 3 soccer pitches. While the Faroes were the primary aim of my travels, one can only reach them via a limited number of airline or even sea routes. For an American, the two simplest airline routes run from Reykjavík, Iceland or Copenhagen, Denmark. My name, Mogensen, is originally Danish, and I’ve always been keen on seeing where it came from. What’s more, I have a very good friend who lives near Copenhagen, and she had offered to let me stay there and show me around. Needless to say, Copenhagen was the easy choice. I spent about 4 days in Copenhagen and the surrounding area with my friend Tilly and her boyfriend Roberto. I first became acquainted with them in 2013 during a study abroad I did in Bonn, Germany, and we’ve been friends ever since. In the span of just a few days, we walked over 30km throughout Copenhagen, high and low. From the changing of the guard at the royal palace at Amalienborg to the famed statue of Hans Christian Andersen’s Little Mermaid, from the hippie district of Christiania to the charming harbor at Nyhavn, we did it all. An unparalleled view of Copenhagen from atop Vor Frelsers Kirke. One of my favorite memories in Copenhagen was climbing to the top of Vor Frelsers Kirke (Our Savior’s Church). The uniquely constructed church is an architectural masterpiece like no other church I have ever seen. The crowning glory, quite literally, is its twisting spire that is encircled by a metal staircase that leads to its top on the outside of the church. 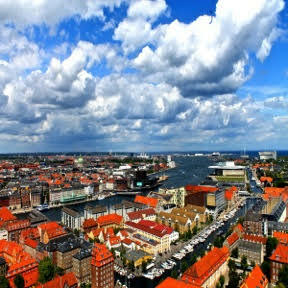 With an unmatched view over Copenhagen, feeling the wind make you feel truly alive up there, you experience a feeling of bliss mixed with a tinge of vertigo. I recommend going close to sundown, as I was fortunate enough to do. Just be wary if you are afraid of heights! A striking cliff face near the village of Gjógv. The Faroe Islands are unlike anything else you will ever see in your lifetime. Your first impression of the country, as you take the 40-minute bus-ride from the airport to Tórshavn, the capital of 12,000 people, is that it is ancient. The land exudes a mythical feel from its towering mountains that plunge dramatically into the North Atlantic at every turn of the winding roads. Adding to the mystique of the islands are the impressive tunnel systems, going both under the above-mentioned mountains, and even under the sea itself to connect some of the larger islands. For example, the tunnel between Vágar, the island that the airport is on, and Streymoy, the island that Tórshavn resides on, goes under the sea for over a mile! Walking throughout the capital, there is a mix of the old with the new. On a peninsula that juts prominently into the harbor of Tórshavn lies Tinganes, the historic district that has been inhabited since the earliest Viking settlers came. It is here that the parliament of the Faroe Islands, the Løgting, stands where it has been held for over a thousand years. Originally, the Viking leaders of the Faroes would meet on the large rocks of Tinganes to discuss matters of import affecting the islands. Today, there is a formal parliament building. Even still, the parliament building retains a distinctive Faroese flair, having a grass sod roof like many of the other roofs you will see in the Faroe Islands. Globie enjoying some Vegemite with our Aussie companions. Besides the major cultural sites in Tórshavn, the most important visit I made while I was there was to the national bus and ferry service building. For about 150-200 dollars American, I was able to get unlimited access to all of the public buses (and ships between the islands!) for the approximately 2 weeks I spent in the Faroes. While the ability to travel anywhere via the public transportation routes was useful, even better was meeting some friendly Australians during the first week of my travels in the Faroe Islands, who were staying in the same hostel as I was in Tórshavn. This chance encounter proved to be extremely fortuitous as they had a rental car that they were happy to take me along in as they toured some of the major islands in the Faroes. Riding along with them, I got to tour the primary two islands of Streymoy and Eysturoy, as well as some of the Northern Isles. As an added bonus, I heard a good bit about Australia and contemporary life there, and even got to try the fabled Australian “Vegemite” spread made famous in a certain song by Men At Work. The secluded village of Gásadalur overlooking the North Atlantic. The highlight of my time with the Australians actually came about on the last day the spent in the Faroes, when we were able to visit the famed village of Gásadalur, which sits at the Western edge of the island of Vágar in a remote area. 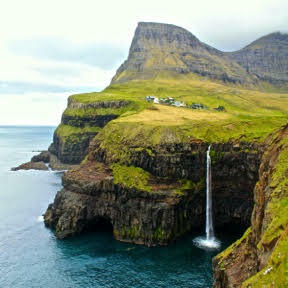 With only about 30 people living in it, the village itself doesn’t offer much to see, but the natural scenery around it is breathtaking, from the mountains, to the sea cliffs, and best of all, the impressive waterfall that cascades from high above on the village plain and into the sea far below. A Grindadráp, or whale hunt, under way. 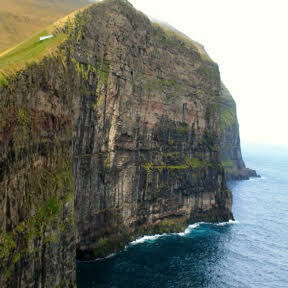 These ramblings around the islands with the elderly Australian couple characterize my first week in the Faroe Islands. Despite bad weather for several days during the second week, I still managed to experience an amazing assortment of quintessential Faroese activities. For one thing, I was fortunate enough to witness the extremely rare occurrence of the ancient practice of a Grindadráp, or whale hunting. 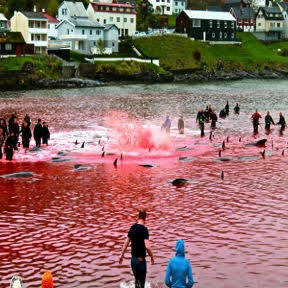 This practice has been going on for centuries in the Faroes, where they trap pods of whales in the many fjords of the Faroe Islands whenever one happens to pass by or through the islands. Because they don’t go out actively looking for pods of whales to hunt in the oceans, and even then, only hunt pods of non-endangered Pilot Whales, Grindadráp are exceedingly rare today. 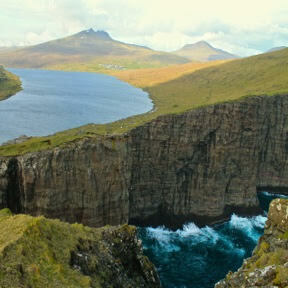 Lake Leitisvatn, the largest lake in the Faroe Islands. A more peaceful and serene day included a hike around Lake Leitisvatn, which is the largest lake in the Faroe Islands. In addition to its status as the largest, what makes this lake particularly interesting is that it is perched several hundred feet directly above the sea. I was able to get some dramatic photos of the lake seemingly floating unaware of the monstrous drop just over the cliffs near its banks. Finally, without a doubt, the most breathtaking and worthwhile endeavor I attempted while in the Faroe Islands was the solo surmounting of Slættaratindur, their highest mountain. 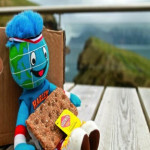 Globie taking a well deserved rest at the summit of Slættaratindur, the Faroe Islands’ highest mountain. 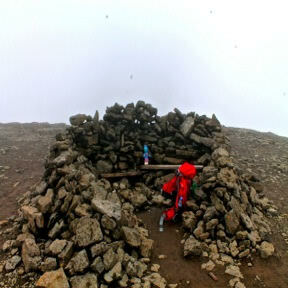 The long climb to the top was made both exhilarating and slightly unnerving once I crossed the cloud line because I couldn’t see too far ahead of me, and yet, the name of the mountain literally translates into “flat summit.” This being the case, it almost seemed as though I was walking on the moon or some similar, otherworldly location. My adventures in the Faroes were diverse and wonderful, and without the Globetrotter Grant, I never would have been able to afford my plane ticket over there (it’s expensive getting that far out in the middle of nowhere!) or been able to use some of the money left over towards my public transportation costs that I used to get around for most of my time there. I will say that although one can’t always rely on meeting friendly strangers to give you free rides in your travels, making connections like that are a large part of what makes traveling so exciting. A huge thanks to the Globetrotter Grant Board for all of my own adventures that they sponsored, as well the many to come as future Globetrotters take up the challenge! 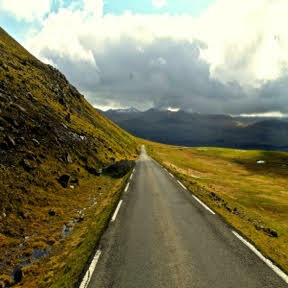 The road down from Slættaratindur. What road will you follow next?